Hallie Altman – Thoughts & stories about my post-grad life in Amsterdam. Does this blog make me look local? Thoughts & stories about my post-grad life in Amsterdam. Does this blog make me look local? Alright, guys – I finally left Bob’s. I mean Chapel Hill. And because of who I am, I did it in the most dramatic way possible – I left the country! My last view of the U.S., the NYC skyline. I’ll admit my decision to come to Amsterdam was an impulsive one – I had some bad luck right after graduation when I lost a digital marketing internship in Atlanta I was really excited about (no one’s fault, just some technicality issues that rendered me unqualified), and I didn’t know where to go from there. It was hard enough to face the fact that my time as a UNC student was over (AKA, my life was over – or that’s how it felt), and the idea of immediately committing to a permanent location was one I couldn’t wrap my head around. Most of my best friends were staying in Chapel Hill for the summer and working in Raleigh, and even though this wasn’t my post-college dream, it was just enough to make me stay in the area much longer than I should have. Of course, my lease at the beloved Green Mile wasn’t infinite, and unless I wanted to move back home (which I didn’t), I had to make moves. Immediately. I got the okay from my parents to move to Raleigh even though I didn’t have a job yet, but I told myself I could find a job if I really tried. For a few weeks, I looked at jobs online and spoke with some of my career mentors, but nothing seemed right. I realized if I interviewed for a job in Raleigh at this moment, it would be clear to the interviewer that I didn’t truly want to stay in Raleigh. In fact, I did interview at a PR firm I had interned with, and loved, but I found myself talking more about my dreams of travelling and living in a big city than I did about my strengths as a public relations specialist. This was a sign for everyone in the interview room. I wasn’t right for the job, and the job wasn’t right for me. Not right then. Here’s one oversized sentence explaining why I chose Amsterdam: I wanted to go somewhere with lots of young people who speak English (I was SO good at Spanish 203, so I know it’s a shock to most of you that I’m not bilingual), I’ve always thought Amsterdam was gorgeous (I came when I was 9, so I remember it very clearly), and it is a hub for established and budding fashion designers, therefor making Amsterdam a little slice of fashion heaven (it’s worth mentioning that Vogue entered the Netherlands in 2012). With all of this in mind, I emailed multiple fashion PR agencies in Amsterdam, found someone who would hire an American who couldn’t speak any Dutch, and booked a flight. I told my closest friends about my decision pretty immediately – they were all happy for me of course, but it was clear that the decision surprised them (and saddened some of them). I know I had discussed the possibility of going abroad with my friends before, but to be fair, I tell my friends a lot of things that are complete nonsense, and even I didn’t know if I was being serious about this. My first day in Amsterdam with my mom, exploring the Museumkwartier in Amsterdam Zuid. Luckily, I haven’t had a ton of time to feel lonely. I’ve been distracted by my full-time work schedule and the fact that I’m in Amsterdam. It’s the most beautiful place I’ve ever seen, and I’ve seen some very beautiful places. I discover something new every day – a restaurant, a shop, a bridge, a neighborhood (the Jordaan is my favorite right now, but I plan to acquaint myself with the oh-so-hip De Pijp next). I’ll talk more about my work experiences and my first weekend in the city (it got weird) in my next post, but the main takeaway from this is that I’m here and I’m determined to make the most out of this experience. I know it seems cliché, but I’m not just learning new things about Amsterdam everyday. I’m learning new things about myself, and that’s exactly why I came. 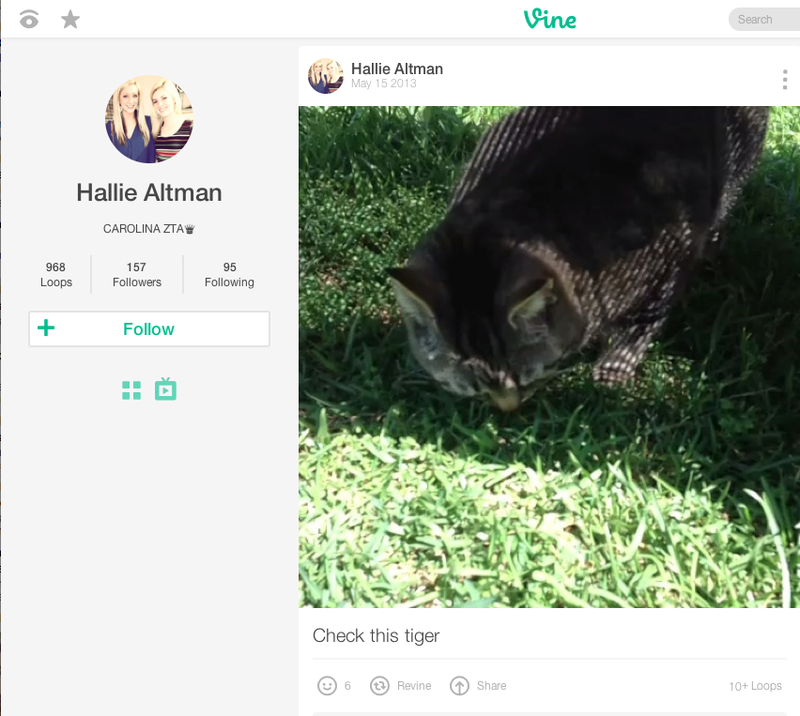 Confession: I low-key thought I was going to become Vine famous the summer after my freshman year. In March, we discussed why certain content goes viral. Things like the value of a retweet over a favorite and the significance of list-style journalism stood out in my mind as viral content I see all the time but would never think to create. As a college student who hasn’t yet entered the real world of journalism, it’s easy to gage my online popularity on the number of likes, favorites, and Snapchat story views I get. (Not at all saying this is okay – but it’s true for almost everyone my age that I know.) But if I write an article and I want to share it with as many people as possible, do favorites do me any good? Not necessarily. Asking friends with a large following on Twitter to retweet the article would get it seen by even more people. Then, there’s the actual content. People love lists. In class, we discussed the number ten. Top 10 reasons to go to school in North Carolina. Ten grilled cheese recipes that will change the way you think about grilled cheese. Ten ways going to UNC will impact your life. In a quick Buzzfeed search with the number ten, 50 articles showed up from the past ten days. We discussed an article in class from OkDork that supplied a ten-ingredient recipe for a viral post. Had I even thought about this before? Not at all. But once I considered the value of lists, I realized how often I choose to read them. We discussed the value of visuals. A post with an image or video is going to get twice as many shares as a post without any visuals. Why is that? People love to look at things. We choose videos and pictures over words all the time – this explains the growth of Snapchat as a news source. We like to communicate with each other using videos and images as well – Snapchat and Instagram are arguably my generation’s favorite media outlets for this reason. We learned to promote our own content. If you want something you post to get attention, seek attention. Ask high-profile friends to share your post. Ask professors with influential Twitter pages to share your post. Share your own post a few weeks later. You never know who might see your work. I noticed in this class that we didn’t have a lot of discussion about anonymous social media posts, and I think that speaks to some overall themes of the lecture, like the large influence we can all have on the media and what circulates networks like Twitter, Facebook, Instagram and Snapchat. As journalism students, it’s important to post for the good of society and always to have integrity in what we put online (or in print). We explored our opinions on new technology and issues in mass communication that none of us had thought of before, and attached these opinions to our names and faces. This is the most significant thing I got out of this class, even if my posts never go viral. In my opinion, there are a million reasons to choose a Mac over a PC when shopping for a new computer or tablet. Macs allow for seamless use with the iPhone and iPads, Apple Care is fantastic, and Macs seem to be more immune to viruses than PC computers. But what really sets Mac apart, whether we want to admit it or not, is the appearance of each product. No one can deny that Apple products are beautiful. After having this thought, I quickly realized I’m not the first person to acknowledge it. Pages of articles from Time Magazine, Telegraph and The Guardian about the beauty of Apple products flooded my screen when I typed “Apple product beauty” into a Google search. Apparently, Apple realizes the visual appeal its products have on consumers. Have you seen the new gold MacBook? It’s breathtaking. Even the name “Apple” sounds better than names like “Dell” or “Lenovo,” not to mention the fact that a black boxy laptop comes to mind when I think of either of these brands. According to Jeffrey Kluger in the Time Magazine article, the name and design of Apple products are bubbly and baby-like (rounded, inviting) because that’s what people are drawn to, and Steve Jobs did this intentionally from the beginning. I have to admit that I don’t know of other advantages or disadvantages of PCs and Macs other than the ones I listed in the beginning. For all I know, a PC laptop would be just as fun and easy to use as a MacBook. But I’ll never know as long as MacBooks look better, especially if the technological differences are small. What the Apple watch might do for your phone addiction. Society as a whole is addicted to technology – primarily smart phones. You can’t walk down the street without seeing almost everyone holding a phone to their face, not talking on it – but staring at the screen. I find myself checking my iPhone every minute for new notifications, and if I don’t have any, I search through social media to see what other people are doing. When I first heard about the Apple watch, I thought, “great. Another piece of technology to become addicted to.” And this, I thought, would be even worse than a phone, because it’s something you can’t escape. You’re wearing it. But earlier today, an article in The New York Times opened my eyes to a potential benefit of the Apple watch that I hadn’t considered. Tech writer Farhad Manjoo wrote about his week with the Apple watch, and tracked his feelings about the product on a daily basis. What surprised me was his epiphany about the Apple watch keeping him from checking his phone constantly. He mentioned going to lunch with a colleague and being able to go hours without looking at his phone and being rude while spending time with another person. “With the Apple Watch on my wrist, my mind remains calm, my compulsion to check the phone suddenly at bay,” Manjoo said. Although he could glance at the watch to see his notifications, he didn’t have the opportunity to respond to them because the Apple watch doesn’t yet offer these features for every app. But Manjoo noticed the notification was enough. He wasn’t distracted by the watch at all, and his colleague didn’t notice Manjoo’s glances at his watch. I was glad to see that Manjoo, a self-proclaimed phone addict, addressed this problem and gave the opposite stance that I was expecting. I assumed that having a phone-like object on your wrist would be even more addicting, but I understand how getting notification hits on your wrist could be just as satisfying as holding your phone and feeling the need to respond to all of your notifications. Although I’m sure the Apple watch will eventually offer more features for responding to notifications, I think for now the watch might help phone addiction problems for busy people who feel like they can’t pull away – at least from the outside. Manjoo ended his diary with an insightful sentence that I have to include, addressing the fact that the Apple watch doesn’t offer many entertainment apps designed to distract the user. Keeping up with the apps. A few times a month, it’s that alert I get on my phone that says my apps need updating. Sometimes, the updates are simply bug-fixes. But lately, the updates consist of new features that I have to keep up with – and just when I get to know the update, there’s a new update again. Constant app updates are obviously the result of fast-paced technological discoveries, and they aren’t going to stop any time soon. It’s the same thing with any technology – you buy the iPhone 5 and the iPhone 5s comes out a few months later. But apps update at an incredible rate – I have a new update available every day. Yesterday, I updated Snapchat. For those of you who don’t remember, Snapchat just made a dramatic change about a month ago, one I’m still recovering from. (Loss of access to my friends’ best friends…so sad.) 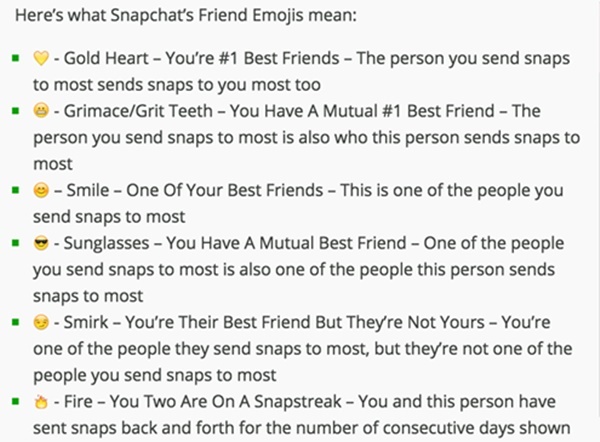 Yesterday, Snapchat decided to add emojis next to certain friends’ names, and I had to Google what each of these emojis meant. Not only that, but the emojis led to a 2-hour conversation between me and my friends about who has which emoji beside who, and what that means. It was like we were finally getting a taste of the ‘best friends’ feature again, but not quite as transparent. Instagram is releasing a new update in “a few days,” according to Mashable. This new update will include new editing tools (as if there weren’t enough already) and a feature where you can select certain users whose posts you want to follow closely. I’m assuming this means you’ll get a notification when these people post. But all I could think when reading about this new update is that it’s going to take me twice as long to edit my pictures, and before I know it, my phone will be blowing up to alert me that one of my friends posted a photo. I really don’t see the advantage of that feature. Other apps have made major changes in the past few weeks as well, and some are set to update soon. Think about Twitter’s fairly new features that show you an “Activity” feed and notifications about what your friends are “favoriting.” I personally don’t care for the extra notifications, but at least they didn’t make the app more difficult to use. Facebook is, of course, adding a digital pay feature to the Messenger app. I’m pretty excited for this one. I’ve found that with the constant app updates, I have to pick my battles. I don’t necessarily utilize every feature offered. Snapchat messenger, for example, is not something I use to communicate with friends. The video chatting feature is too difficult as well – why wouldn’t I just FaceTime? As far as the new emojis go, I’m probably going to ignore them. But I’ll be counting down the days until “best friends” come back. I’ve never been the type to wear “functional” accessories. I tried a watch for a while, but decided it was too bulky. When Livestrong bracelets were popular, I was the only person at my high school who refused to wear one because it didn’t match my outfit. So now I’m conflicted. Technology is becoming too prominent not to wear – think Apple watch, and my favorite fashion designer is designing Fitbits. What am I supposed to do? Elle Australia featured the Apple watch in a multi-page spread in their last issue. Of course, they displayed the special edition watches that cost well over $1,000, but it’s a tech watch regardless. The editors made it a point to pair the watch with statement jewels and this fashion season’s it pieces. Looking at the pictures, I wasn’t bothered by the presence of the watch like I thought I would be. If technology is becoming such a huge part of our lives, why wouldn’t it be something we wear? Now thinking about it, I hold my phone so much that it becomes part of every outfit I wear. I might as well have it strapped to my wrist. So now for the Fitbit. I’ve always thought these were kind of silly. I don’t need to know how many calories I burn each day – if I eat healthy and workout, I’m fine. Not to mention the fact that it’s a giant piece of rubber wrapped around your wrist that looks like a glorified rubber band. Or, it was. Now, Tory Burch designs Fitbits. And they are leather. And silver. And gold. And rose gold. I’ve decided to stop fighting the inevitable, and let tech-functionality find its way into my wardrobe. I’ll be ordering a Fitbit this week. Anxiety? There’s an app for that. This morning, my friend Lauren and I were driving through terrible traffic. I told her traffic gave me anxiety, and it turned into a joke for the rest of the day about how everything gives me anxiety. We looked up ways to soothe anxiety – thinking teas, super foods, certain herbs – that kind of thing. But instead, we stumbled upon a Buzzfeed article that revealed 14 apps for people with anxiety. While we looked at the article, I couldn’t help but think this was crazy. In my opinion, phones give people anxiety. My phone certainly plays into my stress level. The idea of staring at my little screen to calm my anxiety sounds bizarre. So I downloaded the first app on the list – Pacifica. The app is based on Cognitive Behavioral Therapy (CBT), apparently a well-researched technique. The first thing the app had me do was choose what kind of anxiety I wanted to fix. I said “calm daily anxiety” because I don’t have an actual anxiety problem. The other option was to have fewer anxiety attacks – something I’d be shocked could be fixed with a phone. The app then told me to enter my mood daily, and gave me relaxing techniques to calm anxiety. This made sense to me – the app itself doesn’t help anxiety – the app gives you activities that involve leaving the phone. I think I’m actually going to try using the app for a few weeks. Anyone could benefit from it – if anything, the app gives you a reminder to breathe.